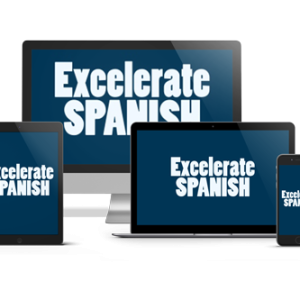 The Excelerate SPANISH program is comprehensive, effective, and easy to use. Just pop in the lesson video on DVD, hit play, and you’re ready to go. Each lesson begins with an introduction of the new vocabulary and structures. You’ll see the words as they are listed on the whiteboard, hear their pronunciation, and model a gesture for each word or phrase. This gesturing, also known as Total Physical Response (TPR) is an important element of the Excelerate SPANISH program. Studies in brain functionality and linguistics show that TPR facilitates foreign language acquisition for all age groups. TPR activates various motor cortices of the brain, making it easier to learn Spanish than you’d ever thought possible! Throughout this introductory phase, words and structures are combined in novel ways and practiced using gestures. Whenever possible, previously taught vocabulary is also inserted as review. By presenting words to you in context rather than in isolation, you’ll quickly develop a “feel” for the patterns and flow of the Spanish language. An intuitive understanding of the rules of language always precedes formal language study as we learn our first language. Excelerate SPANISH logically employs this natural sequencing as well. Note that during the initial period, you won’t ever feel pressured to speak. You see, forcing early production provokes anxiety, which hinders language acquisition. Instead, you’ll be encouraged to speak as you feel motivated or when you have something to communicate. Following the introduction of the new vocabulary, you’ll hear the words and structures again, this time in the context of a series of actions. Embedding the material in action sequences provides not only additional practice opportunities, but also a rich context aiding the brain as it processes and stores information into memory. You’ll see the entire sequence enacted, then you’ll have the opportunity to use gestures to “act it out” on your own. This process works so well that students often remember the associations long afterwards. Simple questions based on the action series serve a dual purpose. The questions offer additional exposure to and practice with the new vocabulary; they also help you to assess your comprehension and provide valuable confirmation of your grasp of the material. Each confirmation delivers a boost to your level of confidence, which in turn increases morale and motivation. On those occasions when you feel unsure about anything you’ve heard, you may simply rewind the DVD and watch the appropriate part as needed. With Excelerate SPANISH, it is easy for you to work at your pace! In addition, each videotaped lesson includes a clever skit or “dramatización” also featuring the lesson themes and vocabulary. The skits are carefully crafted to surprise you with funny, zany, or touching story elements. Tapping into your natural emotional responses to stories does far more than you might expect- it actually turns on the “limbic system,” yet another part of the brain, accelerating you along the road to fluency and improving your retention to boot. Finally, you’ll find leveled reading selections in each lesson for independent reading. These “lecturas” offer you an additional way to engage with the lesson content while continuing to advance towards proficiency. In keeping with the Excelerate SPANISH philosophy, the “lecturas” aim to delight you with fun and unpredictable story lines, plot twists, and endings. Excelerate SPANISH is a complete curriculum for the independent learner. The helpful video component provides the necessary instruction for each lesson, and lesson books make it easy to follow along and to review. 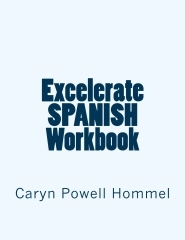 The Excelerate SPANISH workbook contains a variety of interesting activities for further practice and mastery. The Answer Key supplies the correct responses to all questions and activities for both the lesson book and the Workbook. Together, these components represent a wonderful whole-package solution designed to meet your needs and exceed your expectations!